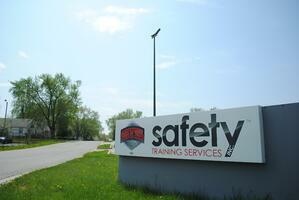 Welcome to the Safety Training Services Blog! This may seem like an odd question, where are you right now? If you had to explain it to someone who had never been there before, how would you tell them to find you? You might say you’re at work, or you’re in the living room. Statements like this paint a clear picture to those who know you. However, “at work” or “at home” or “around the corner” aren’t enough for safety in the workplace. Recently an STS employee, working in their full-time position as a firefighter, was dispatched to a critical medical emergency. The caller was stated that the patient was at a major intersection. Crews arrived and could not locate the patient or the caller. A fire engine, and ambulance, and a battalion chief were all eventually involved in locating the patient. Several minutes passed while crews searched the area and dispatch attempted to contact the caller. 15 minutes later the patient was located inside a construction site about half a mile away from the intersection. After the patient had been transported to the hospital it was determined that the contractors at the site were not aware of the building’s address nor the names of the streets at the much nearer intersection. It is important to have an Emergency Action Plan, it is important to drill and ensure each component operates smoothly in a workplace emergency. It cannot be stressed enough to all workers – you must know the address of your work location if you may ever have to call for outside help in an emergency. Additionally, emergency crews need the same information that you would provide to employees such as site hazards and required PPE. In the above situation an ambulance was driven into an active and fenced construction site and then driven inside an unfinished concrete building. The goal was to reach the patient and provide emergency care, but the patient could have been reached sooner had the employees known the location of the work site and had a plan for directing emergency crews into the facility. In many cases a few minutes allows a fire to double and triple in size, and 15 minutes or less can have serious implications for medical patients. Know your work site, know the emergency response plan. Ask questions before you ever have a legitimate need to call 911 and know your roles before the emergency. At the start of your next shift ask yourself how an emergency crew would find you. Do you know the address? Have the police or fire departments been to your facility recently to familiarize themselves with the layout and hazards? How will you communicate these things in an emergency? If the confined space has no obstructions OR entanglement hazards AND entrant is properly attached to a retrieval system THEN one rescuer is needed to perform a non-entry rescue. It is not the intention to state that a fire department is incapable or will refuse to respond because you did not meet with them prior to your confined space work. As of December 2017 there were over 27,000 fire departments in the United States. (source) and each one of those departments can have vastly different capabilities when compared to the next. You may have a full-time, on-call, or volunteer department. Each one will have different response times and each one will have different levels of rescue service – some having no confined space ability, and will rely on a neighboring department or county rescue team. When called, the fire department will always respond, but without a conversation, you may be expecting a service that is unavailable. Remember that the fire service in your community is on a first-come first-serve basis, the first person to have an emergency in your community will receive service. The second person or place to have an emergency will receive service but it may be coming from the other side of the city or from the next closest city if your department is called elsewhere. For additional resources visit OSHA RESCUE SERVICE REQUIREMENTS where you can view the OSHA and NFPA standards, and download the Rescue Team Evaluation Tool. The Hazardous Waste Operations and Emergency Response (HAZWOPER) standard requires employers to provide training to employees who provide emergency response services during releases of hazardous substances, 29 CFR 1910.120(q)(6). The level of training the employer must provide depends on the role the employee will perform in a response. 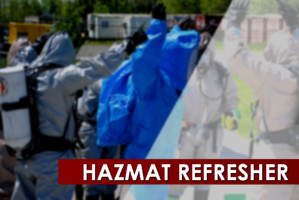 What's the difference in the level of hazardous material (hazmat) training? Does OSHA allow computer based training for hazmat refresher training? 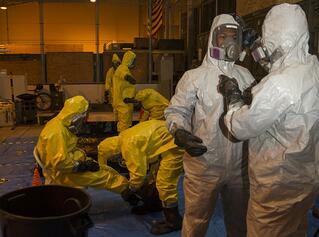 Does OSHA allow you to break up hazmat training over different dates/times? What does OSHA do if I don't get my annual hazmat refresher training? Employees must be trained to the first responder operations level if they will be part of the initial response for the purpose of protecting persons, property, or the environment from the effects of the hazardous substance release. Employees who respond for the purpose of actually stopping the release must be trained as hazardous materials technicians. Responders at the operations level must receive at least eight hours of training or have sufficient experience to objectively demonstrate certain competencies listed in the HAZWOPER standard. In addition, the HAZWOPER standard requires that operations and technician level employees "receive annual refresher training of sufficient content and duration to maintain their competencies, or shall demonstrate competency in those areas at least yearly." 29 CFR 1910.120(q)(8). It is important to note that training required under 1910.120(q) is dependent upon the anticipated duties and functions of the responder. Training and competencies must be consistent with each employee's anticipated role. For example, certain course topics could be suitable for operations level or hazmat technician refresher training, however they may not provide proper refresher training for personnel assigned as incident commanders (individuals who assume control of the incident scene). Furthermore, an employee trained as a hazmat technician for responses to certain types of emergencies (e.g., agricultural emergencies) may not be adequately trained to respond to other types of emergencies (e.g., chemical releases or spills). Computer-based training may meet some refresher training requirements, provided that it covers topics relevant to workers' assigned duties. It must be supplemented by the opportunity to ask questions of a qualified trainer and by an assessment of hands-on performance of work tasks. In OSHA's view, self paced, interactive computer-based training can serve as a valuable training tool in the context of an over-all HAZWOPER training program. However, use of computer-based training by itself would not be sufficient to meet the intent of the standard's various training requirements. Their position on this matter is essentially the same as their policy on the use of training videos, as the two approaches have similar shortcomings. OSHA urges employers to be wary of relaying solely on generic "packaged" training programs in meeting their training requirements. Training required under HAZWOPER includes site-specific elements and should also to some degree be tailored to workers' assigned duties. In order for the training to be effective, trainees must have the opportunity to ask questions. This requirement could be met by providing a telephone hotline so that trainees will have direct access to a qualified trainer. The trainees' mastery of covered knowledge and skills must also be assessed. It is not clear whether "validation of course-work completion" as described in the advertisement you enclosed means that this particular computer-based training program actually assesses whether workers have mastered the covered material. 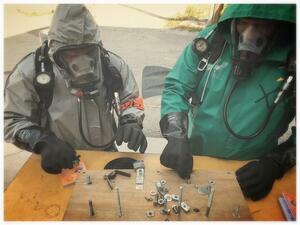 Hazardous waste operations can involve many complex and hazardous tasks. It is imperative that employees be able to perform such tasks safely. Thus, auditing of worker performance is required for all types of HAZWOPER training. In the case of refresher training, this requirement for auditing of worker performance could be addressed during periodic safety meetings. Traditional, hands-on training is the preferred method. The purpose of hands-on training, for example in the donning and doffing of personal protective equipment, is two-fold: first, to ensure that workers have an opportunity to learn by experience, and second, to assess whether workers have mastered the necessary skills. 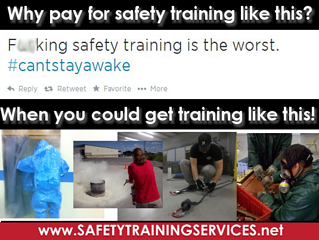 The employer may determine that hands-on training is unnecessary for a given refresher course. However, if an employer elects not to use hands-on training in their refresher course, the employer must first assess the employees' skill level, and ensure that workers remain competent in their current and any newly assigned duties. In conclusion, it is possible in some cases to use computer-based training in meeting the refresher training requirements of 29 CFR 1910.120(e)(8), provided that the computer-based training covers topics relevant to workers' assigned duties and is supplemented by the opportunity to ask questions of a qualified trainer, as well as an assessment of worker skill degradation through auditing of hands-on performance of work tasks. Refresher training may be given in segments so long as the required 8 hours have been completed by the employee's anniversary date. We also point out that 8 hours is a minimum requirement; many employers will find it difficult to cover all topics listed in the training requirements in the minimum allowable time. The competencies to be covered during training sessions may demand more than 8 hours. When developing training, employers must structure their refresher training based on the employee's expected job duties. If the date for refresher training has lapsed, the need to repeat initial training must be determined based on the employee's familiarity with safety and health procedures used on site. This means if you haven't kept up your skills, you may need to repeat a full hazmat training course. If a full course is deemed not necessary, the employee should take the next available refresher training course. And as OSHA states it, "There should be a record in the employee's file indicating why the training has been delayed and when the training will be completed." If you're quick and efficient treating and stabilizing patients, building mechanical advantage systems, and evacuating patients, don’t forget: you’re still entering a confined space. Each space will have its own hazards and unique controls in place such as ventilation, PPE, and lockout tagout. Follow these work practices for safe entry and a rescue may never be necessary. Follow these practices in an emergency and you begin to ensure a stable environment for the rescuer. What does a permit-required confined space need? The presence of an emergency doesn’t allow us to ignore safety – prior to entering or supervising a confined space all entrants, attendants, supervisors, and rescuers must be trained in the duties they’re expected to perform. No matter their role they must know the space hazards, including the route, symptoms, and consequences of exposure to the hazards in the space. Get training to build on your team’s role as rescuers, make them competent entrants with a hands-on, interactive confined space entrant program. Is there more than one way to tie a knot? 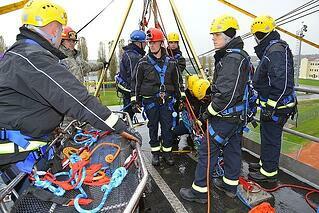 In high angle rescue or confined space rescue the crux of our rescue systems are our knots. It is important as a rescuer that you understand the strengths, limitations, and appropriate applications of the knots your team uses, but is there more than one way to tie each knot? Is there more than one way to tie a knot? YES! As an instructor and a rescuer it is important to know multiple ways to reach the same destination. What I mean by this is that you knowing multiple paths or techniques to reach your end result of a successful rescue is paramount since most teams operate in anything but routine environments. As a rescuer you may be in a situation that is not routine, that doesn't lend itself to the one method you learned in that one class, that method to rig a system or tie a knot may not be practical because you are now inverted in a confined space with multiple patients below you. As an instructor you may have students who have been tying knots since birth and others who have never held a piece of rope in their life. You cannot take the approach that the student just isn't getting it, perhaps you're just not teaching it the way that works for them. Knowing multiple methods may help you find the way that works for a particular individual - guide them, show them the other methods. As long as any given method brings us to the same end result, without any extra twists or strain to the rope, and without using an extraordinary amount of time, it is an acceptable method. The goal here is to be proficient in whatever you do and be capable of doing it and 3 A.M. when called to a rescue. As an example, I am aware of three ways to tie an Alpine Butterfly or Lineman's Knot: the twist method and two variations on the hand-wrap method. Any of these three methods creates the chosen knot and any argument made for one method over the other is typically only a matter of preference since you are creating the same knot each time. Don't let yourself become the victim of routine or complacency. Because you ALWAYS work standby rescue for only two types of confined spaces, or you ONLY pick-off workers from a fall into their harness doesn't justify knowing ONLY that single method that you work with each time. At some point your routine will be broken, equipment will be missing or fail, or you'll have multiple patients outside of your routine situation. Get out of your comfort zone and never stop preparing. There are multiple ways to tie knots. Learn a new one today! 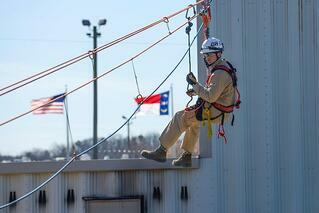 Indiana Rope Rescue Technician: Do I Need Annual Training? After passing the state’s written test and practical skills you may feel like a certified rope technician who can take on the world. Depending on your level of training and experience you might be capable of rigging the world, maybe not. More importantly, do you know what's required to maintain your certification? In the state of Indiana your Operations or Technician level certification never expires. Currently, from the state, there is no refresher or continuing education requirement. You could train eight hours per week or never touch a carabiner after your class and, in both cases, you remain certified. Is the Indiana Department of Homeland Security the only governing body for you as a rope rescue technician? NO! What standards apply to you as a rescuer in Indiana? MANY! NFPA 1670 specifies requirements for your organization or authority having jurisdiction. NFPA 1006 specifies technical job performance requirements in which you should be competent. A requirement for your initial training was to meet NFPA 1006 requirements in addition to the CMC Rope Rescue Manual 4th edition. NFPA 1983, though often cited as a use standard, specifies testing and certification requirements for software and hardware used for rescue. None of these standards states specifically that a certain amount of training is required to maintain certification or proficiency, only that you need to be competent in specific skills, though it doesn't specify how often it should be assessed or demonstrated. From NFPA 1006 we can infer that as long as you are a practicing rope rescue technician you need to be able to perform those skills. No matter what NFPA says, it is arguable that NFPA standards are not enforceable by law. Unless adopted by Indiana code they are not criminally punishable. The counter to this argument is that if your rescue team was negligent and did not adhere to a standard and caused an injury or death, your team may be held liable for not following an industry consensus standard. Standards developed by NFPA and similar standards development organizations (SDOs) are "voluntary consensus standards," created through procedures accredited for their consensus decision-making, openness, balance of interests represented, and fairness by the American National Standards Institute (ANSI). Can we be more specific? YES! OSHA may be misunderstood by some in the fire or rescue service. In a great deal of firefighter or rescue training there is not a lot conveyed about OSHA and its applicability to firefighters in the state of Indiana. OSHA states more clearly an annual training requirement for confined space rescue teams though it is not considered a very robust or demanding standard. Again, we see here general provisions that a rescuer must be capable and proficient. 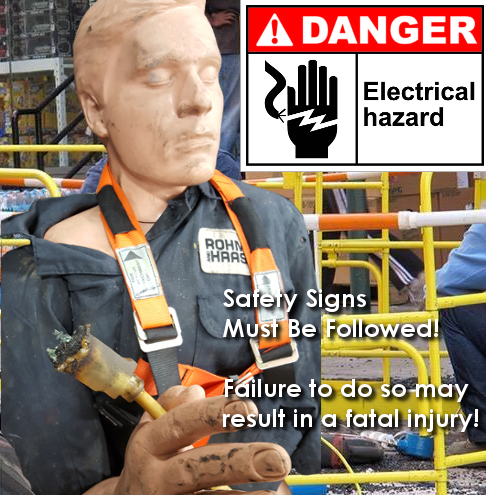 Ensure that affected employees practice making permit space rescues at least once every 12 months, by means of simulated rescue operations in which they remove dummies, manikins, or actual persons from the actual permit spaces or from representative permit spaces. So, once every 12 months a rescue must be simulated. Also in this standard is the statement that if you had to perform a live rescue in a true emergency you may count that actual emergency as your annual rescue training. · The Indiana Rope Rescue program requires no recertification or continuing education to remain certified. · Every standard (NFPA 350, 1006, 1670 and OSHA 1910.146) applicable to rope rescue states that a rescuer must be proficient and/or competent. 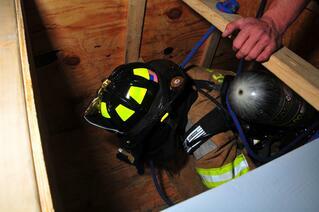 Only OSHA's confined space standard states that a rescue be performed annually. You need to perform and document hours of training to meet standards but also perform highly technical skills under extremely stressful conditions. If your company or your department provides rescue services your employees must be prepared. One training drill annually does not create proficient rescuers. From the classes I have taught it is easy to distinguish the students who train monthly or weekly from the students who only train annually. Lacking proficiency in basic knots is a clear indication that you are not prepared for a rescue today. In conclusion, the National Fire Academy, in its studies and training on initial and established rapid intervention teams (firefighters who rescue trapped or lost firefighters from fires) acknowledges that this is a physically and mentally demanding task. They state that the minimum set forth by applicable standards (two firefighters performing no other task but standby to initiate rescue) is not enough to prepare the rescuer for the stressful conditions they will encounter and state that the standard for rescuing downed firefighters should be viewed as the minimum. In this same way, standards applied to your rescue teams should be seen as the minimum. Always aim higher because your coworkers and your community demands it. Do you want you rescuing you? While there are countless rescue classes, instructors, books, and online resources to learn confined space rescue, there is no universal standard that dictates how a confined space or industrial rescue should be conducted. What should be universal is the careful assessment of the hazards within the space to create a safe environment for the confined space entrant. There are many common practices but what might be true and accepted in one part of the world may not be held in the same regard in another workplace. There are as many choices in rescue type as there are unique confined spaces in existence but generally there are two types – entry rescue and non-entry (or retrieval) rescue. No matter who might provide these services, fire departments, in-house rescue teams, or contract personnel on standby, it is important to understand the intended scope and limitations of each. While our primary concern is the safety of the entrant, let’s consider for a moment the financial impact of non-entry and entry rescue. If the design and hazards of a given space allow for it, non-entry rescue requires far less investment by the employer and is a satisfactory rescue method. In its simplest form, non-entry rescue requires a tripod (or other anchor) and a winch rated for human beings (not tools and equipment). Any employee entering the space would require a harness in addition to the training required to perform entry, initiate a rescue, or operate as a confined space attendant. If there are no obstructions within the space, this can be daily routine for many in order to enter a space and it can be the rescue method – no additional personnel are required to enter the hazardous space in order to retrieve or rescue the entrant. 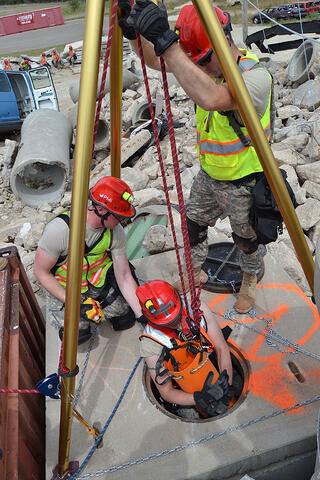 The leanest confined space rescue team, in terms of equipment, and streamlined and who is responsible to make entry in the event of an emergency will require countless hours of training to maintain proficiency in patient care, personal protective equipment, atmospheric monitoring, and rescue techniques. Additionally, there should be training which addresses the stressful nature of rescue when the rescuer personally knows the coworker needing rescue, as well as any additional hazards now present within the space. Confined spaces are hazardous at the start of a work day, if you have an emergency within the space it is multiplying the complexity of the incident. 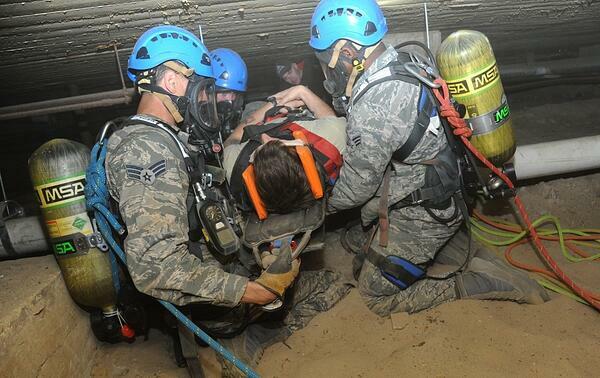 OSHA requires that entry rescue teams perform at least one rescue per year. The following statement may sound extreme – do you want a rescuer entering a confined space to rescue you if that rescuer has only performed one rescue? Your rescue team now has the need to perform under stressful conditions with a variety of equipment, within a variety of spaces, using one of hundreds of techniques to remove the entrant having an emergency. What does this have to do with cost? You can maintain an OSHA compliant rescue team with team members performing one rescue per year, but they may be ineffective. 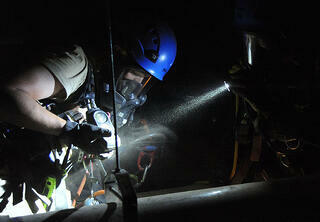 As a confined space rescue instructor, I have encountered teams who train weekly, monthly, quarterly, and annually. Those who only train annually may eventually rescue or recover the entrant. Those who train annually, when compared to rescuers who train monthly or more, typically lack the confidence and quick decision-making skill to accurately and expediently size-up the emergency, make entry, and retrieve the entrant. With these considerations, your choice of entry or non-entry rescue may be quite clear in terms of your budget. However, if your confined spaces do not allow an unconscious person to be successfully retrieved from around, under, or over obstructions in your confined spaces you must have a safe and proficient entry rescue team. Do you know the average response time of your local fire department? Depending on your location it could be less than five minutes, maybe ten minutes, possibly fifteen minutes, or even greater. Once you’ve assessed your fire department and their response time, add at least ten minutes. Why are we counting minutes? Let’s assume the team is available, their response time to your facility is only 6 minutes. Once they have arrived they will assess the situation, form a plan, gather equipment, and assemble at the space to begin rescue. If you are currently entertaining the idea of the fire department as your rescue team you must ask yourself, in the absolute worst atmosphere that your employees may encounter will they be able to hold their breath for 5-25 minutes? Eliminate any emergencies related to the space itself, consider only medical emergencies such as low blood sugar, cardiac arrest, or traumatic injuries from a fall from scaffolding inside the space. With a window of 5-25 minutes your employee may have gone from a very survivable situation to one that may not be reversible. You may rely on non-entry rescue but someone but either your team or your fire department will be the next step if the chain of events are anything but routine. 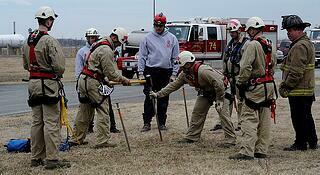 The decision of rescue method comes down to the nature of the space and the proficiency of your team. Do your spaces have obstructions or a narrow opening that would make it difficult to remove an unconscious patient? If yes, you need to a plan for entry rescue. Do your spaces lack internal configurations and obstructions? Does the opening to the space make it possible to remove an unconscious person? If yes, you could initiate a non-entry rescue. No matter your choice, your method, or your hazards, no one wants a rescuer who has limited training, “just enough” training, or the “minimum requirement.” Create an environment for your rescuers and the expectations you have for them where you are building confidence, critical thinking ability, and they are demonstrating competency. The Occupational Safety and Health Administration (OSHA) offers Outreach Training for 4 industries: Construction, General Industry, Maritime, and Disaster Site Work. OSHA has done well over the years to expand the reach of their programs to help workers become more knowledgeable about workplace hazards and their rights. Specifically, OSHA's Outreach Training Program provides training on the recognition, avoidance, abatement, and prevention of these workplace hazards. The construction industry deserves a little extra attention as it accounts for about 1 in 5 worker deaths. 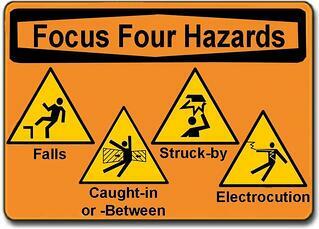 The Focus Four hazards (falls, struck by object, electrocution, and caught-in/between) are especially dangerous. In fact, according to OSHA, eliminating the Focus Four would save over 600 workers' lives in America each year. Here are OSHA's top violations as they relate to the construction industry and how you can learn more about/avoid them! Designed to protect employees on walking/working surfaces with an unprotected side or edge above 6 feet. 1926.501(b)(10) - Roofing work on low-slope roofs. 1926.501(b)(4)(i) - Holes and skylights. Employers are bound to protect construction workers from falls and falling objects while working on or near scaffolding at heights of 10 feet or higher. 1926.451(g)(1) - Each employee on a scaffold more than 10 ft above a lower level shall be protected from falling to that lower level. 1926.451(e)(1) - When scaffold platforms are more than 2 ft above or below a point of access. Cross braces shall not be used as a means of access. 1926.451(b)(1) - Working levels of scaffolds shall be fully planked or decked. 1926.451(g)(1)(vii) - Personal fall arrest systems or guardrails systems. 1926.451(g)(4)(i) - Guardrail systems shall be installed along all open sides and ends of platforms. Covers general requirements for all ladders. 1926.1053(b)(1) - Portable ladder access. 1926.1053(b)(4) - Shall be used only for the purpose for which they are designed. 1926.1053(b)(13) - The top or top step of a step ladder should not be used as a step. 1926.1053(b)(16) - With structural defects. 1926.1053(b)(22) - An employee shall not carry any object or load that could cause the employee to lose balance and fall. Now that you are aware of these heavily cited topics related to the construction industry, you can take steps in avoiding them. Your first might be to attend, or send your employees to attend a 10-hour OSHA training for construction. In this training, one will learn more about OSHA (and why we have the standards we do), health hazards in construction, personal protective and life-saving equipment, the Focus Four hazards (huge topic in construction), as well as some other construction related topics. For more information, or to attend our next OSHA 10 hour training for construction, click the button below. If you are in need of any other OSHA related safety training, visit our Training Services page to see what else Safety Training Services can offer you & your company. Our next 10-Hour OSHA for Construction will be on Thursday, June 29, 2017! Who Needs Electrical Safety Training? As we close out May and therefore Electrical Safety Month, I wanted to share a bit of information for those not familiar with the training requirements for avoiding electrical hazards. Even if you are familiar with the requirements, allow this to serve as a quick reminder to verify that you are in compliance with your relevant OSHA standard. *Workers in these groups do not need to be trained if their work or the work of those they supervise does not bring them or the employees they supervise close enough to exposed parts of electric circuits operating at 50 volts or more to ground for a hazard to exist. For those who are on this list, but do not follow the expection list just above, training may be a necessary need to assist these employees in avoiding electrical hazards and a knowledgeable understanding of the potential of this energy. As you may surmise, proper precautions must be taken to guard against these hazards. Too many employees, too often, are victims of injuries (or worse) because they fail to take these proper precautions to guard against such hazards. Failure to recognize the hazard of contact with energized electrical equipment can be a fatal mistake. Qualified employees are those permitted to work on or near exposed energized parts. Those not not deemed qualified persons, but whom risk similar electrical hazards, shall also be trained in and familiar with any electrically related safety practices. The different training requirements for qualified and unqualified employees are outlined below for reference. Once again, as Electrical Safety Month comes and goes with the month of May, there is no better time to access your electrical safety needs. If you are in need of either electrical safety training or arc flash training, or simply have a question regarding these topics, contact Safety Training Services today. We look forward to assisting you with your electrical safety & training needs! 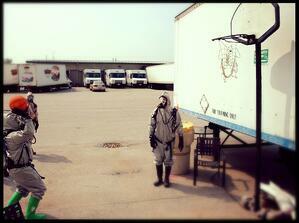 Who Can Teach HAZWOPER Refresher Classes? 1910.120(e)(6) Qualifications for trainers. Trainers shall be qualified to instruct employees about the subject matter that is being presented in training. Such trainers shall have satisfactorily completed a training program for teaching the subjects they are expected to teach, or they shall have the academic credentials and instructional experience necessary for teaching the subjects. Instructors shall demonstrate competent instructional skills and knowledge of the applicable subject matter. So, this hopefully clears up the question, right? However, this statement doesn’t prevent a subject matter expert who may have not completed the 40-hour HAZWOPER class from teaching a portion of the class. To answer the question at the start of this post, the safety person who didn’t attend the course could certainly teach something within the realm of HAZWOPER if they completed a training program for the subjects, have academic credentials and instructional experience. They must be competent in what they are teaching the students. Further in the standard it speaks specifically to refresher training 1910.120(e)(8) which, very basically, restates the requirements of the initial class and that they should be met in the refresher training. 1910.120(q)(8)(i) also states employees shall receive annual refresher training of sufficient content and duration to maintain their competencies, or shall demonstrate competency in those areas at least yearly. If your HAZWOPER refresher instructor is capable of providing this instruction and meets the other requirements for a “qualified trainer,” they certainly can teach. What the concern might be is that someone who has no training in a fully encapsulating protective suit is now teaching a group of people who must be competently trained and refreshed annually to do so – following the standard this person would not be authorized to teach this section, though could be qualified in other areas. Throughout the OSHA standard there are various exceptions and alternate conditions for training [1910.120(e)(9)], new employees [1910.120(p)(7)], and employees who have received HAZWOPER training previously but are new to the site [1910.120(e)(9)]. This may have helped you determine who can teach your training. Certainly, if you have any questions regarding any aspect of HAZWOPER training please reach out to us, we’d be happy to walk through our process or your process and needs with you.